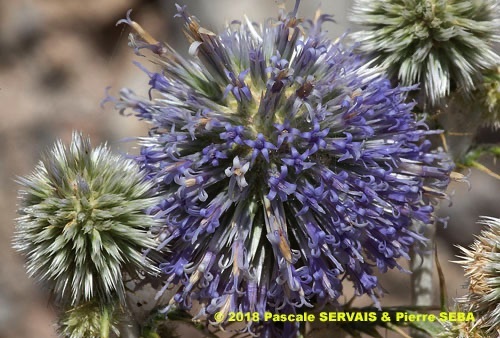 Echinops microcephalus Sibth. & Sm. 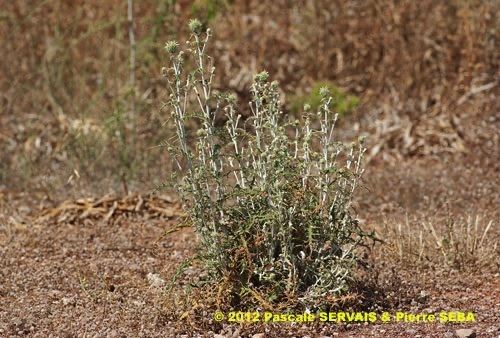 Plante herbacée, hermaphrodite, épineuse, proche des chardons, à tiges blanchâtres, velues, ramifiées depuis la base. Feuilles alternes, divisées pennatiséquées, embrassantes, sessiles, à longues dents terminées par une épine, poilues sur la face supérieure, tomenteuses sur la face inférieure. Fleurs bleu vif, à fleurons tous tubulés, entourées de bractées rigides verdâtres terminées par une courte épine, réunies en capitules réduits à une seule fleur. Capitules groupés en tête parfaitement sphérique de 10 à 22 mm de diamètre. Ovaire infère. 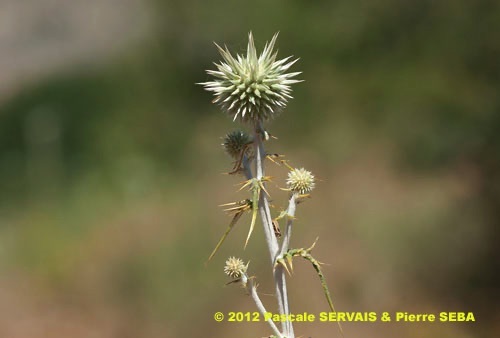 Plant herbaceous, hermaphrodite, spiny, close to thistles. 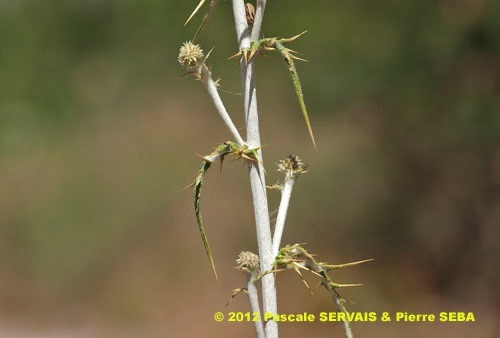 Stems whitish, very hairy, branched from the base. 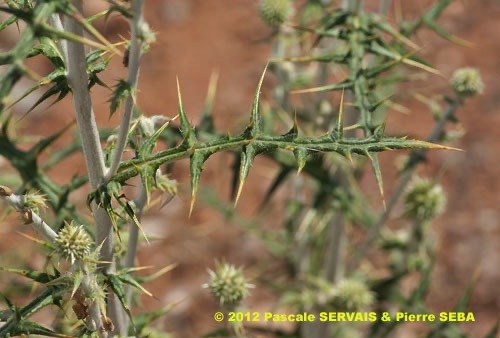 Leaves alternate, dissected pinnatisect, clasping the stem, sessile, with long teeth finished by a thorn, hairy on the upper surface, pilose on the lower surface. Flowers bright blue, with only disk-florets, surrounded by rigid, greenish bracts finished by a short thorn, joined together in capitula reduced to only one flower. Capitula grouped in a perfectly spherical head from 10 to 22 mm in diameter. Ovary inferior. 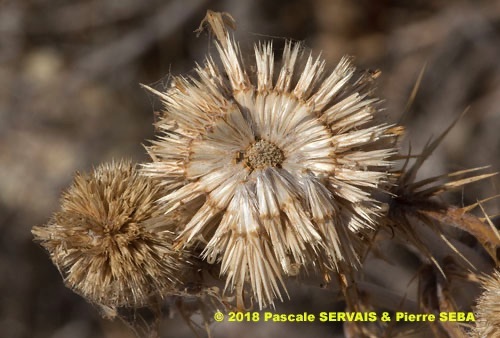 Fruits, achenes with a pappus. terminées par une longue épine. = qui a une petite tête, en référence à la forme de l’inflorescence. bracts finished by a long thorn. 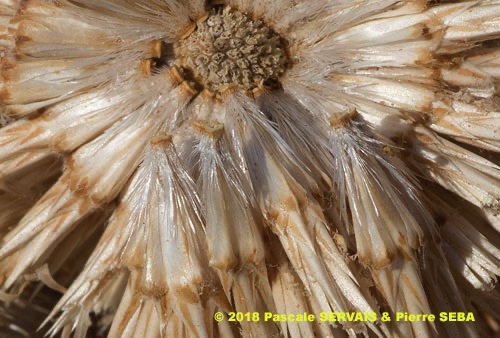 = with a small head, referring to the shape of the inflorescence. 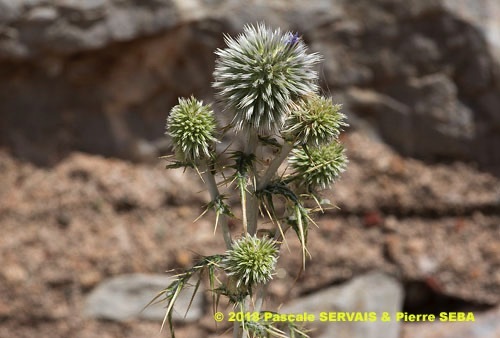 Échinops à petite tête — Oursin à petite tête.